The new redesigned LiteFuze LT series voltage converters are up to 30% more compact and 20% lighter equipped with the convertingbox technology. LT series remain the most recommended & #1 rated voltage transformers worldwide. LiteFuze's own convertingbox technology reduces the weight and guarantees no noise. All models are step up & step down for worldwide use and some models feature detachable cord and circuit breaker protection. 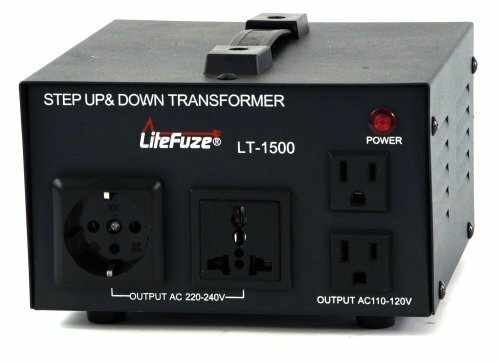 The LiteFuze LT-1000 is a heavy duty voltage converter/transformer which is designed for continuous use. It converts 110/120 volts to single phase 220/230/240 volts and convert single phase 220/230/240 volts to 110/120 volts. The LiteFuze LT-1000 voltage converter features two output sockets: one for 110V and one for 220V voltage. The 220V Universal output socket will accept almost any plug from around the world. With it's dynamic design and high resistance copper coil the LT-1000 offers durable performance. To ensure safety, the LiteFuze LT 1000 Converter is fully grounded and fuse protected. This step up/down voltage converter also comes with a free euro plug adapter. 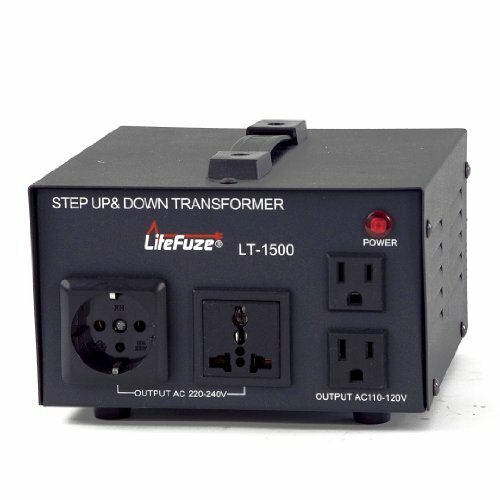 The LiteFuze LT-1500 is a heavy duty voltage converter/transformer which is designed for continuous use. It converts 110/120 volts to single phase 220/230/240 volts and convert single phase 220/230/240 volts to 110/120 volts. The LiteFuze 1500 voltage converter features two output sockets: one for 110V and one for 220V voltage. The 220V Universal output socket will accept almost any plug from around the world. With it's dynamic design and high resistance copper coil the LT-1500 offers durable performance. To ensure safety, the LiteFuze LT 1500 Converter is fully grounded and fuse protected. This step up/down voltage converter also comes with a free euro plug adapter. 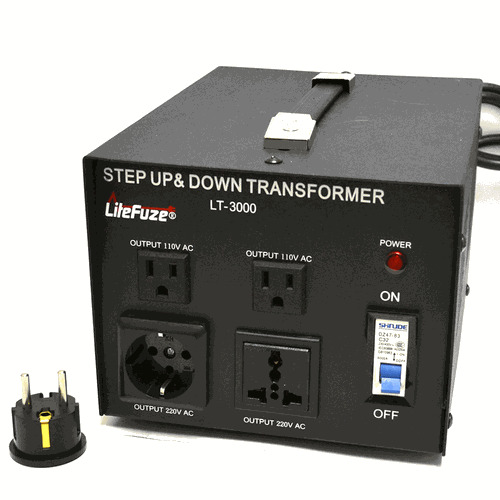 The LiteFuze LT-2000 is a heavy duty voltage converter/transformer which is designed for continuous use. It converts 110/120 volts to single phase 220/230/240 volts and convert single phase 220/230/240 volts to 110/120 volts. The LiteFuze LT-2000 voltage converter features two output sockets: one for 110V and one for 220V voltage. The 220V Universal output socket will accept almost any plug from around the world. With it's dynamic design and high resistance copper coil the 2000 offers durable performance. To ensure safety, the LiteFuze LT-2000 Converter is fully grounded and circuit breaker protected. This step up/down voltage converter also comes with a free euro plug adapter. 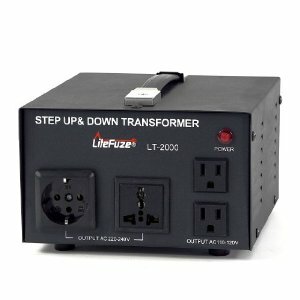 The LiteFuze LT-3000 is a heavy duty voltage converter/transformer which is designed for continuous use. It converts 110/120 volts to single phase 220/230/240 volts and convert single phase 220/230/240 volts to 110/120 volts. The LiteFuze LT-3000 voltage converter features two output sockets: one for 110V and one for 220V voltage. The 220V Universal output socket will accept almost any plug from around the world. With it's dynamic design and high resistance copper coil the LT-3000 offers durable performance. To ensure safety, the LiteFuze LT-3000 Converter is fully grounded and circuit breaker protected. This step up/down voltage converter also comes with a free euro plug adapter. 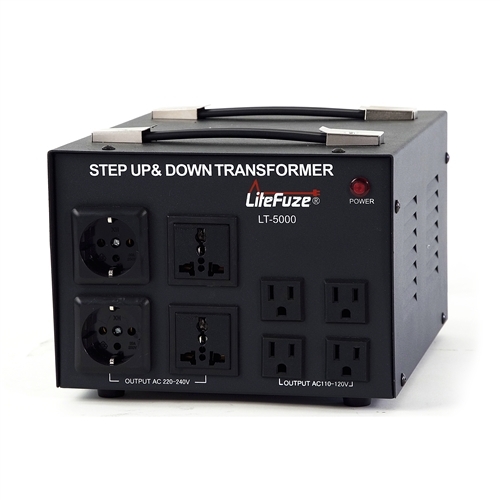 The LiteFuze LT-5000 is a heavy duty voltage transformer designed for continuous use. With up to 5000 watt capacity, this unit functions as both step up (110/120-volt to 220/230/240-volt) and step down (converts 220/230/240-volt to 110/120-volt) voltage transformer. Made from high resistance copper coil, the international voltage converter is durable and reliable. Multiple output sockets enable use of multiple items at one time and the dynamic casing design offers ventilation to the 5000 watt voltage converter. This LiteFuze LT 5000 converter is fully grounded and comes with circuit breaker protection for safer operation. The Shucko plug adapter makes this 5000 watt voltage converter compatible for use in Asia, Africa, and also in Middle East Countries. This switch will let you conveniently turn off the transformer when not in use. This will accept virtually any grounded or ungrounded plugs from around the world. No, need for messy plug adapters to plug your appliances or electronics in to this transformer. Refer to the image below to see the different plug types it accepts. European countries such as Germany and France use Shucko plugs.The shucko socket on the VT series will accept Grounded or Ungrounded shucko and European/Asian/African plugs. This enables you to safely ground your products with grounded shucko cord without any need of purchasing hard to find plug adapters or changing the plug type on the cord. The LT series is equipped with two 220V sockets and one 110V socket. This allows you to use multiple items at once. When connecting multiple items please make sure that the combine wattage for both items is less than the maximum capacity of the transformer. The LT series is equipped with a replaceble fuse for safe operation. The fuse will cut off the power to the voltage converter if its overloaded. The standard package includes two spare fuses. Grounded US cord completes the ground from the input to the output sockets of the VT series for safe operation. We have also included a FREE Grounded Shucko European plug for use in European outlets. Grounded UK or Australian plug are also available upon request. The transformer comes with a free grounded shucko plug adapter which is compatible with German and French Shucko outlets. This plug is also compatible for use Asia, Africa and Middle East countries.